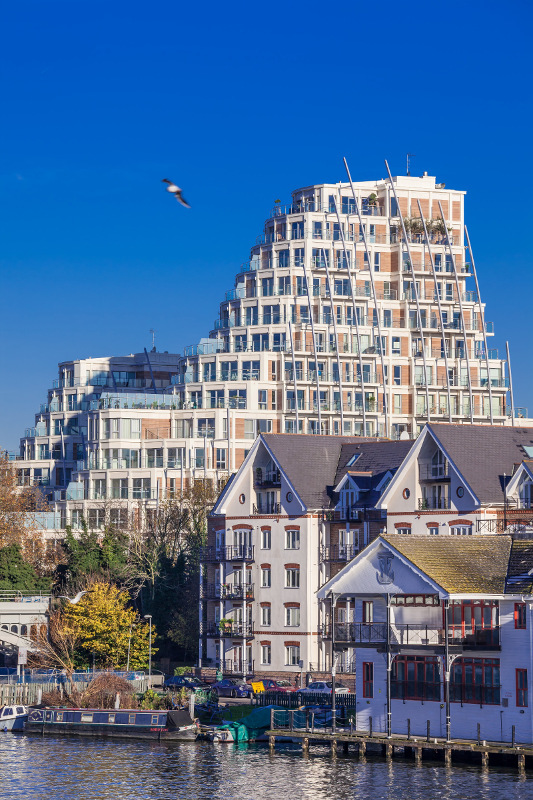 Shackerley’s Sureclad® ceramic granite cladding system has brought a cohesive appearance to a visionary development scheme comprising two very different award winning buildings on the banks of the River Thames in Kingston. The cladding was specified by NHP Leisure Developments who acquired the site fifteen years ago and drew up the detailed plans for the scheme with Paul Brooke Architects, securing planning permission from Royal Borough of Kingston Council in 2008. Redrow London subsequently purchased the Kingston Riverside development and the complex of 210 luxury apartments was completed for its new owner and their scheme architects, Broadway Malayan, by main contractor Midgard and their project architects, Sprunt. Kingston Riverside features two blocks of 11 and 15 storeys connected by a six-storey link block. These ‘towers’, with spacious private terraces stepping back from the river, are framed by curved ribs that give the development a contemporary maritime style which is consolidated by Shackerley’s ‘wood-look’ ceramic granite. The building earned Redrow London the 2014 WhatHouse? Silver Award for ‘Best exterior design’, and was ‘Highly Commended’ in the ‘Best design of four storeys or more’ category at the 2014 Housebuilder Awards and the ‘Residential High-Rise Development’ category at the 2013/14 UK Property Awards. Kingston Heights was constructed for NHP by main contractor United House and includes a 142-bedroom hotel, 81 private apartments (pre-sold to Redrow London) and 56 affordable homes (managed by Affinity Sutton). The development incorporates a ground breaking district heating scheme abstracting solar energy stored naturally in the River Thames and has won numerous environmental awards.